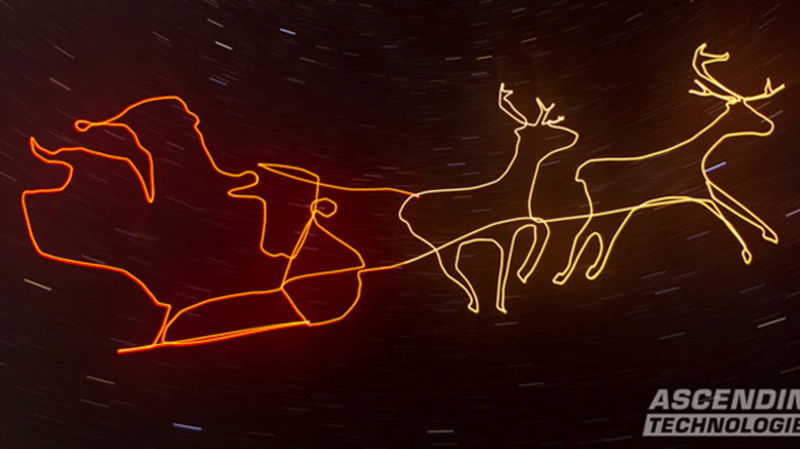 In celebration of the holidays, the German tech manufacturer Ascending Technologies took the concept of "drawing” a picture in the air using a light and a camera with a long exposure setting to the next level. The company attached a color-changing LED light to one of their own AscTec Falcon 8 drones before releasing it into the night sky. It was programmed to follow a calculated flight path using the drone’s navigator software and relied on GPS data to slowly illustrate the massive images in the air. Each picture is impressively detailed, with some including nearly 400 pre-determined position points. The camera’s exposure lasted as long as 10 minutes in some cases in order to capture the full image. To watch each piece of light art come to life, check out the video below.